Itzik, also known as Izak, was one of three sons born to Yiddish-speaking Jewish parents. When Itzik was a young child his family moved to the city of Radom. Itzik left school when he was 11 to apprentice as a women's tailor. After he apprenticed with several tailors in Radom and Warsaw, he went back to school and earned a tailor's license. 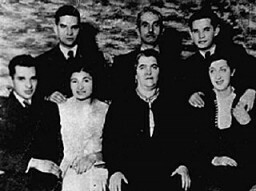 1933-39: In 1938 Itzik married Taube Fishman, the daughter of his first employer, after a 13-year courtship much opposed by her family. 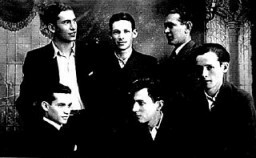 They lived in Radom, where Itzik opened his own shop in their apartment on 49 Zeromskiego Street. In July 1939 they had a son, Max. Germany invaded Poland that September and occupied their city on the 8th. The Germans forcibly removed all the Jews from our street. Itzik and his family were left with only the clothes on their backs. 1940-44: Radom's Jewish Council assigned Itzik's family to a shack, which was later enclosed in a Jewish ghetto. He made clothes for the Germans, who gave him food in return. In 1942 the Germans assigned Itzik and other master tailors to work in an SS shop. One night in August, German soldiers entered the ghetto and started shooting and deporting people. He tried to hide his family in the shop, but they were caught in a roundup and his wife and son were wrenched away from him. Itzik was selected to remain in the ghetto as a forced laborer. Two years later, Itzik was deported via Auschwitz to the Vaihingen camp where he was liberated by French troops on April 5, 1945. In 1950 he immigrated to the United States.